It’s all far too confusing – even for the pros! Now, I know this may be controversial. But I am just going to come straight out with it. The rules on strokes and lets are just too confusing. The rules are opaque and difficult to apply. Judging by recent professional tournaments, and especially last year’s Commonwealth Games, the professionals seem to be as baffled as we are. We have created a scenario that is now akin to the terrible situation that football now finds itself in. In trying to clarify the offside rule, they have now made it so complex that the grey areas now obscure the whole purpose of the rule. We see the difficulty in applying the rules on lets and strokes at every PSA competition. A player asks for a let, the referee rules, the player appeals and then, after 30 seconds, the decision is supported or overruled. While this is going on, Joey Barrington and his co-commentator describe the anguish of the video referee. Did he/ they make enough effort? Did the player clear? Was there a line to the ball? Could they have played it anyway? Even then, with the benefit of slow motion, multi-angle replays, the outcome is not always clear. 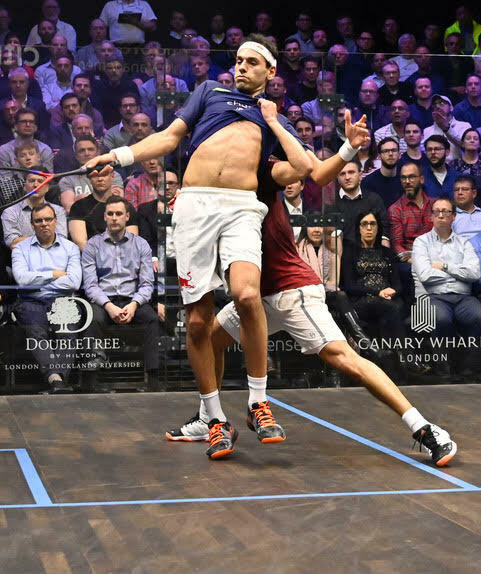 Now, this is all very entertaining for us squash players but totally baffling to the non-player. What is also striking is they rarely actually reference the wording of the rules, but more the “intent”. Next time you are watching SquashTV, see for yourself. Again, this is a mirror image of the crisis in Football. VAR has demonstrated clearly that, in sport, there are more grey areas than black and white. Trying to write words around what ultimately becomes a judgement is futile. So, I have a simple suggestion. We need to accept that there is no clear, easily applicable, cast iron, black and white definition of a “let” or a “stroke”. As a sport, let’s just own up to it. There, now that’s done, let’s discuss what we are trying to achieve and perhaps an answer? So, what is the “let” / “stroke” rule actually trying to achieve? Well, like all rules, it is trying to ensure fair play. It is trying to say what should happen to the score when a player was not given a fair opportunity to play the shot they wanted AND predict the outcome of that shot. Now, this is where squash is pretty unique. We play in a box where space is limited. There are inevitable “traffic problems” at times and we need to reflect this. In a comparison with football again, our dilemma is more like the rules around a “foul” than offside. Our “let” is like a “free kick” and a “stroke” is more like a “penalty”. So, our rules refer to the ability to play “winning shots” (among other things), but what does this actually mean? • The relative position where the opponent SHOULD have been if they had got out of the way! But, does this mean the player should have been further left, further right, further to the back, or indeed the front? This is all a judgement, but one that is not even referenced directly in the rules! To pretend it is a science is futile. So, I have a simple proposal. The rules should reflect and embrace the ambiguity. Let’s just give the referees the scope to properly exercise their judgement. 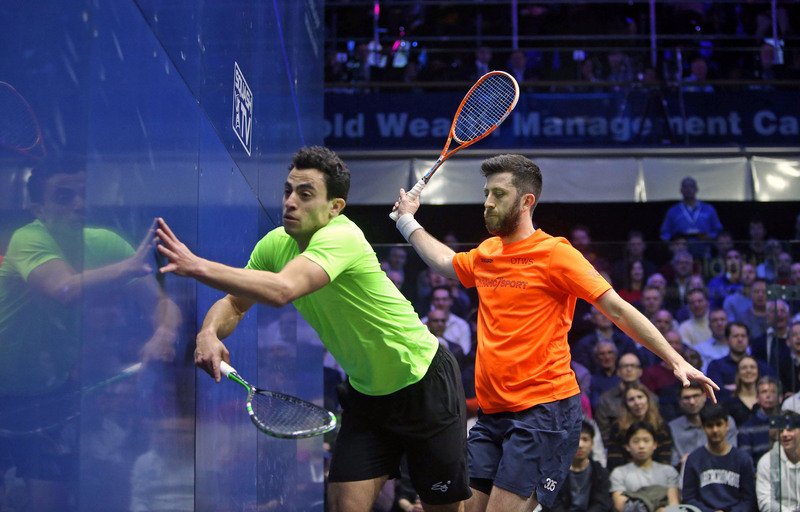 If there is interference immediately before or during the shot, or the player felt there was a risk of hitting the opponent with either the ball or the racket, the player striking the ball should stop and ask for a let. If, in the opinion of the referee, there was insufficient interference to disadvantage the player striking the ball, “No Let” is awarded. If, in the referee’s opinion, it would have been a winning shot, then a “stroke” is awarded. Otherwise a “let” is awarded. If the referee felt the player was justified in stopping due to the risk they perceived of hitting their opponent at that moment, a “let” is awarded. If the referee feels that a player was trying to unfairly gain an advantage by creating interference, or making insufficient effort to play the ball, then a “No Let” is awarded. In reality, this just reflects the thought process of most referees anyway. But, it embraces the reality of our sport. We know the rules around lets and strokes tie our game in knots. We all struggle to explain the rules to our friends and colleagues. How can it ever aspire to be a popular sport for TV when the most important rule is so difficult to understand? Squash lover and Junior Squash coordinator at Grove Park Squash Club, Cheadle Hulme. Passionate about growing the game, particularly making it more inclusive and making this a truly sustainable sport for everyone. I like the acknowledgment that the element of subjectivity and judement is ever present, but I think only allowing strokes for prevented winners is too restrictive. The line of thinking you outlined means there’s not too much incentive for players to clear the ball. As long as they can do it slightly enough that they’re not preventing a *winner* they can force a let. This would make it pretty easily to neutralize a bad position in the rally by interfering enough to get a do over. I think the avenues to get a Stroke when there was no effort to clear need to remain. I think penalising a lack of effort to clear is very subjective. Often there is subtle holding in of players etc. The fact that there is interference should be enough to make give the referee the option to use their judgement. I know in my own Squash I get in the way at times (mainly when I am starting to fatigue) and that may look like a lack of effort. But whether I tried or not, the fact I am in the way means the referee would need to make a decision. As part of the decision process, they would mentally move me (a judgement) to where I should have gone and decide whether a winner could be played by my opponent. would come into play – especially if there was a pattern. What do you think? It would be great to hear other opinions as well. Just as there multiple schools of philosophy, there are also widely divergent lines of thinking in dealing with interference situations. Another good suggestion. I think videos would help but I still wonder whether it would cancel out the grey areas in the current regulations that try to treat lets and strokes as black and white decisions? I personally think there is inevitably “ad-hocism” in the decision for a let or a stroke anyway. Therefore I think we just embrace it and simplify the rules to address it i.e. you get in the way, you throw yourself at the mercy of the referee’s judgement as to what the fair outcome should be. I also think it could make for some cool TV graphics with the video ref moving the interfering player on the replay to where he should have moved to demonstrate the reason for the let or stroke! This could apply typically in those situations where the commentators say something like ” That’s either a Stroke or a No-Let”! It’s like saying the sky is either clear or overcast- a nonsensical statement when there are a few scattered clouds overhead. I agree with you that often it is a judgement call by the referee to choose between 3 different decisions, but so long as the ref is consistent, the players will generally accept it. The problems arise when similar situations are dealt with differently either by the same ref or by the over-rule by the video ref. I like your suggestion about the videoref indicating where the positioning of the non-striker should be ideally, though I wonder how much extra time would be used up between rallies. I think these simulations would be most useful after each match to discuss contentious decisions, so that the refs and players know what is expected the next time such a situation crops up.